Emmanuel Macron’s face in a jar. Emmanuel Macron’s face in a jar and his arse in a sling—let them eat cake! Morning Mail’s vainglorious Editor spends approximately $550 per year on internet data, hairdressers, deodorant and toothpaste! No eye glitter, shrinkle creams, fake tans or face makeup for this stallion! Reason enough for looking like a slob. Mr Turnbull charged taxpayers $246,000 expenses billed as “e-materials” from May last year to June this year, about 15 times what the average MP spent. In the same period Minister Scott Morrison spent $11,354 and Bill Shorten $2,563. Like so much about Turnbull’s secretiveness his cost of vanity can’t be found. Of course, the little pipsqueak French President Emmanuel Macron and his wife Brigitte keeps her hair in fine order and his face heavily made up with the help of their official hairdresser, whose services to the presidential couple cost the French taxpayer a whopping €5,200 (A$8,035) a month. Their highly paid hairdresser must be ready with his or her hairdryer and make-up kit “in the Élysée Palace and during visits”, according to the Court of Accounts, whose calculations make the total hair and make-up bill an annual €62,400. (A$96,416). The 39-year-old Emmanuel, a prize-winning actor as a student, has signed off all the bills, saying an attractive public image is essential. But critics said it all pointed to a vain head of state who was spending excessively ‘to hide his real face’. 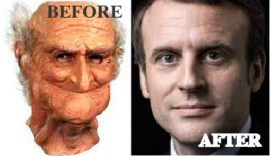 Mr Macron, the youngest president of France since Napoleon, is using a make-up artist known only as ‘Natacha M’. She gets to work before every public appearance, whether in a TV studio or at the Elysee Palace in Paris. Le Point news magazine reported that she had already put in two separate bills, one for the equivalent of £9,000,(A$15,597) the other for £15,000. (A$25,995). A spokesman for the president said: ‘We called in a contractor in as a matter of urgency’, adding that Natacha M had also assisted Mr Macron during his presidential campaign. Mr Macron has always used his boyish image to his advantage, despite his wife Brigitte Macron being 25 years older than him. Mrs Macron was his drama teacher at school, before the two embarked on a passionate affair while she was married to someone else. The pair now like to be pictured out cycling, or acting like a pair of youngsters who are happiest at their beachside home in Le Touquet, northern France, or in a holiday villa in Marseille. Mr Macron’s party is called En Marche! (On the Move! ), but is more commonly known as EM! as these are the same initials as Mr Macron’s. A member of the opposition conservative Republicans party said it all added up to a ‘hyper-vain president’. Mr Macron’s aides meanwhile insisted that the make-up bill would now be reduced, and pointed to the fact that his predecessors also spent a great deal on their personal image. Former conservative president Nicolas Sarkozy spent more than £7,000 (A$12,131) a month on make-up, while the almost bald Socialist Francois Hollande gave £9,000 (A$15,597) a month to his barber. If you think this Macron story is bad then this one is the final indication the Globalists are indeed ignorant arseholes . Just heard a report from Alan Jones on 4BC about Macron announcing that he is going to close France’s nuclear power stations in favour of wind & solar generation. France has 80% of their power generated by nuclear, no emissions, & supports much of Europe with energy. Can’t wait to see the riots & revolution when he tries this idiocy! Obviously much of his creams , lotions, etc used for his beauty treatments has seeped into his brain. I guess the French will vote him in for a second term as president. I wonder in garlic has anything to do with their new idiocy? That’s what Germany has done and now scrambling to construct coal fired steam driven generator power stations to replace the abandoned nuclear steam driven generator power stations as the wind revolution reaches electricity grid crisis. Closing nuclear power in France would be political suicide! I can almost here Mother Merkle screaming “Non Non not now Nanette” as it would highlight how much Germany rely on France for electricity and amp-lify (please excuse the pun) the parlous state of “The Motherland” power grid. It is France and Poland’s coal fired generators that are keeping the lights on. It is fairly clear that Turnbull and Macaroon share at least a few traits; vanity and narcissism being the most obvious. I would love to see the little creep dragged from his office by a rampaging mob, which is not so difficult to imagine given the events in Paris the last couple of weeks. France has Macron with stupid ideas on Climate Change, we had Turnbull so into Climate change, both seem to think it is only them, and them alone, that can save the planet. We the voter can do nothing other than roll the eyes at leaders that show such stupidity. If Mr Macron is spending $8,000 a month on getting tarted up I shudder to think what Mrs Macron is spending, especially since it doesn’t seem to be working. Macron is going to close the nuke power stations ….. Macron is going to up the tax on fuel …… Does Macron run the damn country on is own? What about the French parliament, doesn’t it get a say? Next post: Question: what is human slime? Previous post: China sneaking into Parliament?